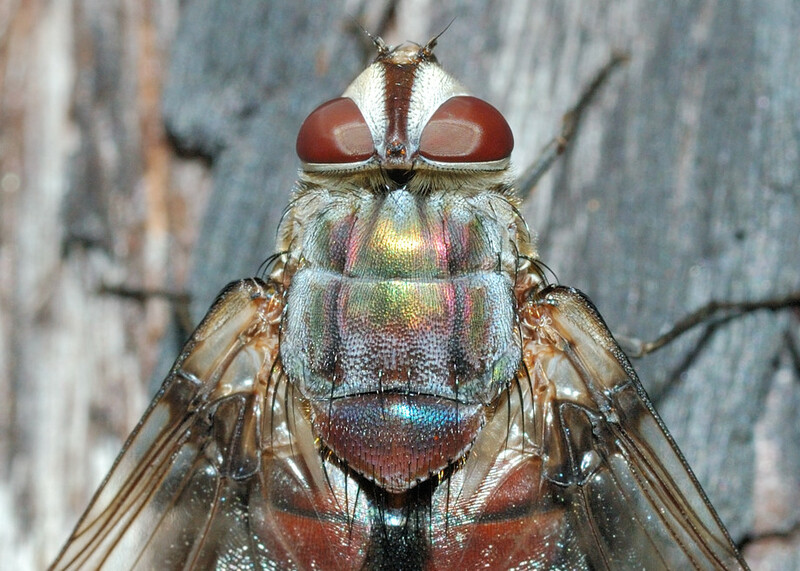 This page contains pictures and information about Tachinid Flies in Rutiliini, subfamily Dexiinae (or Proseninae in some reference) that we found in the Brisbane area, Queensland, Australia. The Rutiliini include the largest and most handsome files. They are usually brilliant metallic colours. 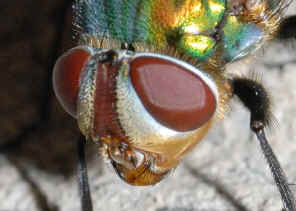 Usually they have long legs with face elongated under the eyes. 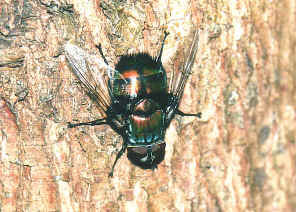 Some of them look similar to those flies in Ameniinae, which is another group of large metallic flies in family Calliphoridae. 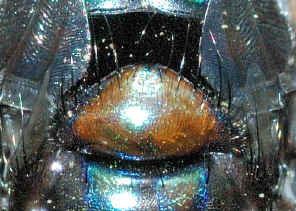 As other group in subfamily Dexiinae, flies in Rutiliini are parasitic in larval Coleoptera (beetle) especially Scarabaeidae. 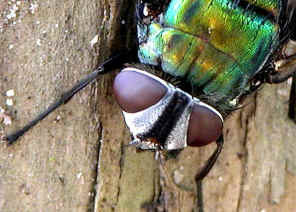 Adults are usually found resting on the sunny side of tree trunk. Adults feed on flowers, notably Eucalyptus. 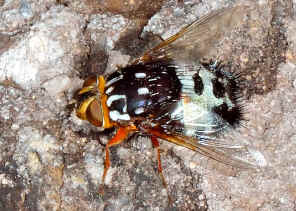 Females rest on ground when larvipositing. 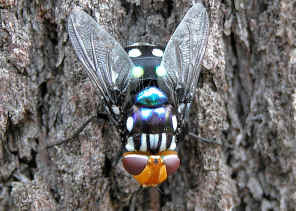 Black and White Rutilia Fly is a very large size attractive fly with metallic black and white colours. They fly with a medium loud buzzing sound. 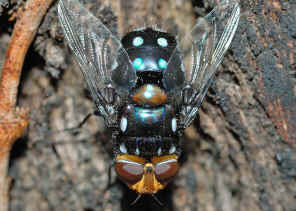 We found the insect once on Nov 2012 in Karawatha Forest on Rocky Track. Please check this page for more information. There is only one species in this subgenera. 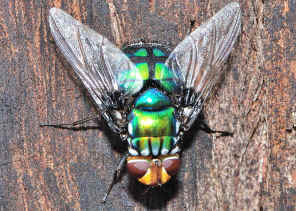 This fly can be identified by its non-pollinose parafrontals brilliant metallic green to blue-violet in colours, and its has three setae on postalar callus. Check this page for more information. There are three species in this subgenera Ameniamima. 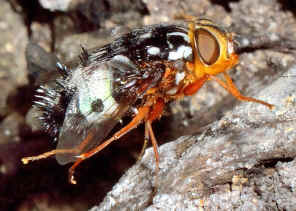 Flies in this subgenera show strong convergent resemblance to Calliphorid flies of genus Amenia. 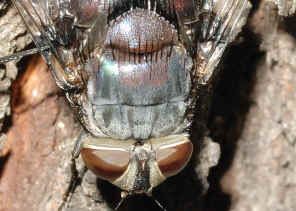 They can be separated by the Amenia flies have plumose antenna and a pair of silvery white pollinose spots on postalar position. 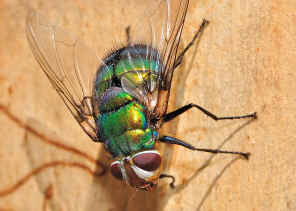 This large Golden Head Rutilia Fly is metallic dark blue-green in colour with bright orange-yellow colour head. 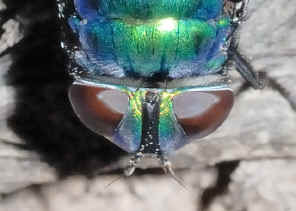 On the thorax and abdomen there are the shiny white spots patterns. Different individuals may have slightly different patterns. Please click here for more information. 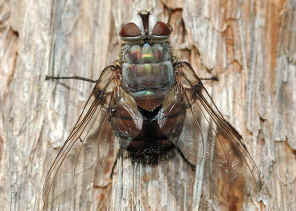 This large Golden Head Rutilia Fly is dark purplish black in colour with non-metallic dark brown scutellum. Please check this page for more pictures and information. 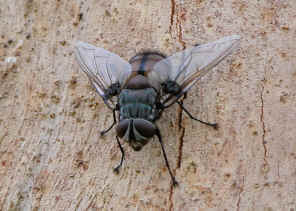 This fly is seasonally common on the gumtree trunk in Karawatha Forest. 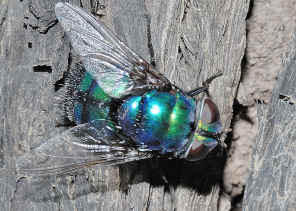 This is the largest Snail Parasitic Blowfly species. 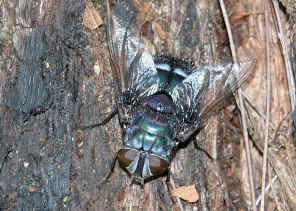 They are mostly seen from mid Dec to mid Feb in eucalypt forests in Brisbane. Please check this page for more information. In early summer, we saw many of them resting on Iron-bark gum tree trunk in Karawatha Forest Bushtail track. 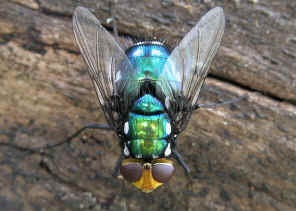 They look similar to the above species but smaller in size, with bright green metallic colour. Please visit this page for more information and pictures. 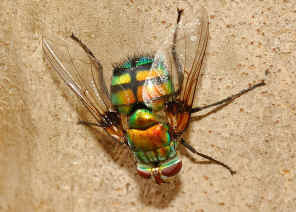 The fly's hairy body was bright metallic golden-green in colour, a bit darker than the R. (C.) formosa otherwise looked very similar. 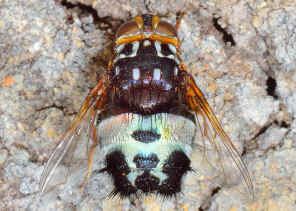 On the thorax there is the white pollinosity but may not be very obvious on some individuals. Please check this page for more pictures and information. 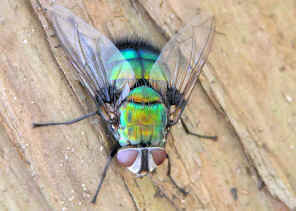 This large Green Rutilia Fly is dark metallic green in colour. 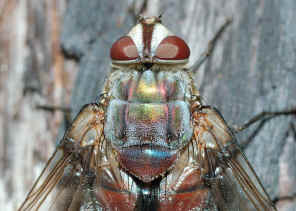 Its head look darker that the other Rutilia Flies for there are the dark hairs on its interfrontal area (middle of its face). Click on here for more information. Pictures taken in Karawatha Forest. 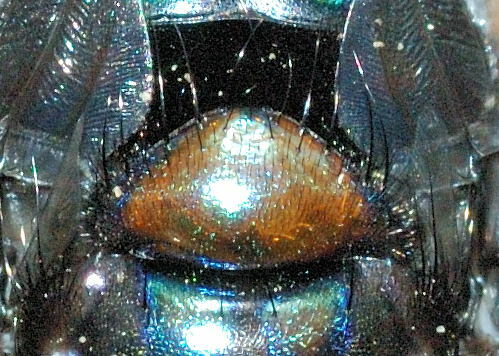 This fly larvae parasites on Scarab Beetle larvae. 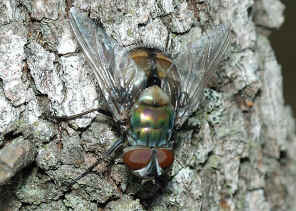 This is the largest Tachinid fly that we saw. 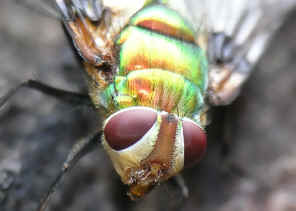 They are usually found in forest or semi-forest, resting with heading downwards on tree trunk about a meter from ground. More information and pictures can be found in this page. 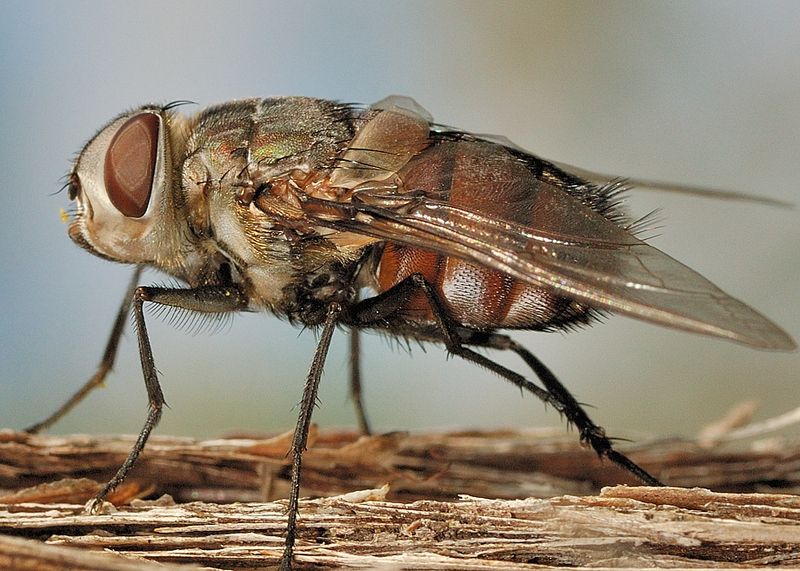 This is one of the largest Tachinid flies that we saw. 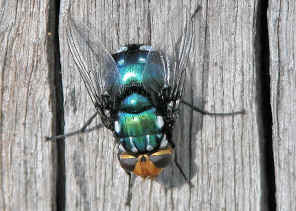 Its hairy body is metallic grey blue in colour, with dark patches near the base of the wings. More information and pictures can be found in this page. 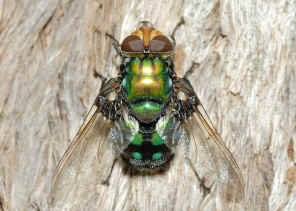 This is a medium size Grey Rutilia Fly with metallic dark brownish-green body colours. More information and pictures can be found in this page. 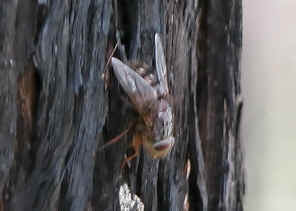 From those pictures that we were taken, we noticed that this fly likes to rest on large Paper Bark tree trunk. 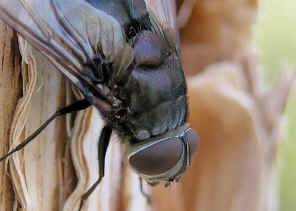 This is a very large Grey Rutilia Fly. More information and pictures can be found in this page. 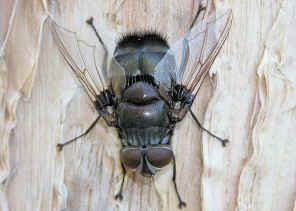 This is a medium size Brown Rutilia Fly with dull brownish-grey body colours. More information and pictures can be found in this page. Last updated: November 25, 2012.